Tahitian Noni International (Morinda) sells Tahitian Noni® Juice and other Noni based products only through network of Independent Product Consultants. 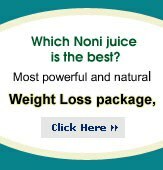 We are an Independent Product Consultant of Tahitian Noni International (Morinda) and you are purchasing products through us. If you have any question regarding Tahitian Noni® products found on our website, please feel free to contact us. If you don't want to place an order online or want to pay by Money Order, Bank Draft or Certified Check, please download Offline order form. You will need to print this form and fill all the necessary information. Send this form along with your payment to avoid any delay in processing of your order.